Chronic obstructive pulmonary disease (COPD) is actually comprised of more than one respiratory disease. Most cases of COPD are made up of three related conditions which work together to obstruct proper airflow in the patient’s lungs. The primary conditions which comprise COPD are chronic bronchitis, emphysema, and chronic asthma. Unfortunately, any damage that this disease causes in the lungs is permanent, and COPD tends to get progressively worse over time. For this reason, it is important to begin treatment for COPD as soon as possible. For those with COPD, there are plenty of COPD clinical trials available around the country. In order to manage this respiratory illness effectively, it is important that patients learn to recognize the signs of deterioration in their condition. If you recognize that your symptoms are getting worse, then you can seek additional medical attention as soon as possible. Again, receiving the appropriate treatment at the earliest stage possible is very important, since this can help to preserve better lung function for as long as possible. This disease often goes undiagnosed because people confuse the signs of COPD for signs of aging, and this is just one of the reasons why it can be so deadly. Initially, people may not notice the symptoms of COPD as the disease has yet to cause any damage to their lungs. Once the symptoms of COPD do become noticeable, they will only get worse over time if the disease is not treated effectively. The earliest signs of this respiratory disease will vary from person to person, and they can also vary depending on which underlying disease is more prevalent. This is why most health care officials will recommend that people try to be more aware of the potential warning signs for COPD. A person who has this disease will often have more than one of these at any given time. After being diagnosed with COPD, some patients may experience an exacerbation where the symptoms of their condition will rapidly become much worse. 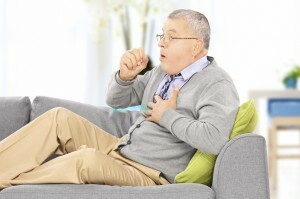 COPD exacerbations are very serious, and they require immediate medical attention. Following one of these episodes, doctors may choose to change their drug regimen and course of treatment for their patients. All of these can also be signs that your disease is starting to get worse. Currently, the best option available for COPD patients is to try and manage the symptoms of their disease as effectively as possible. The latest developments from clinical trials on COPD point to a more positive future for all who have been affected by this disease. With a better understanding of the pathogenesis of COPD and other illnesses like it, researchers can develop new medications and preventative therapies which will directly target these symptoms at their source.